Question: What’s a bladder diary, and is it really necessary that I keep one? Answer: A bladder diary is a great tool for those looking to treat their incontinence, and should be used as a first step in understanding your specific condition. A bladder diary will track the number of times you have gone to the bathroom in a day, if you’ve had any leakage (and the amount), and also tracks your food and drink consumption. By recording all of this over a series of days (at least 2-3 but up to a week or two can be really helpful), you may be able to see trends over time. For instance, perhaps you always experience leakage at a certain time of day, or after you’ve had a certain food or drink. These realizations can help you adjust your routine (or your diet) to avoid leaks. And, the tool can be extremely helpful to your physician, as it gives him/her a better picture of your situation and may help advise better treatment options that will work for you. In short – yes! Everyone who experiences incontinence should try keeping a bladder or bowel diary for at least a couple of days. What you see may surprise you, or, at the very least, provide a roadmap of your condition that you can share with your doctor. While most people wait until January to start making resolutions, we at NAFC feel that it’s always a good time for positive change. 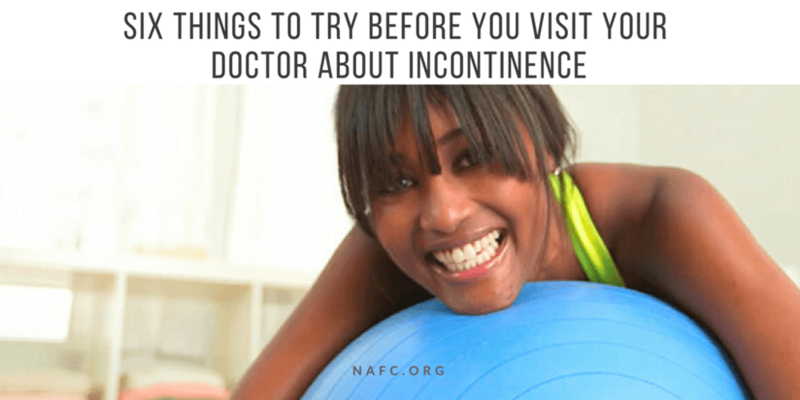 Here are three things you can do RIGHT NOW if you are dealing with incontinence. Yes, we know it’s the holidays and this is probably the last thing you want to hear, but ensuring you’re eating and drinking healthy foods is very important when you have incontinence. Sugar, caffeine, alcohol – these are all common triggers for those with incontinence so be careful when you consume them. Learn your triggers by keeping a bladder diary for a few days to see if you notice a pattern in what you’re eating or drinking and your incontinence. Often, modifying your diet can be a very simple step in incontinence management. Tip: If you do get the urge to indulge this holiday season, try to limit it to just one or two days. There is often an urge to binge on not-so-great-for-you foods throughout the full month of December, but limiting yourself to a couple of days can help keep things in check. 2. Find an absorbent product that fits you. Many people suffer from leaks even when they use protection. The key to overcoming this is to find a product that is comfortable to you and that fits well. A product that is too big, or too small, can cause leakage. And pay attention to the packaging – getting a product that isn’t designed specifically for incontinence will do you no good and just leave you feeling frustrated. 3. Make an appointment to see your doctor after the holidays. Yes, it’s probably the last thing on your mind right now, but by making the decision to talk to someone about your incontinence you’re taking matters into your own hands. Plus, lining up a doctor visit now will ensure that you stat 2017 off on a good note. Tip: Need help finding a doctor? Use our specialist locator to find one in your area. The hubbub of the holidays are over, and most people are now back to work, trying to work their way through the long winter. This time of year – the stretch from January through March (and even April and May in some places) – is tough, waiting out the cold until the great thaw comes to free us from our indoor rut. After all, you can only watch so much Netflix. Here are four ways to stay motivated through the frigid months. 1. Find ways to surprise yourself every day. There is no better way to break free of a rut than to do something different. And it doesn’t have to be big – take a new route to work. Try a new restaurant. Make a new recipe. Do something nice for a fellow coworker. Changing up your routine, even in a small way, can add interest to your life and introduce you to new experiences and sensations. The winter months are a great time to take up a new skill. That pottery class you’ve always wanted to try? Give it a go! Want to learn how to cook? There are classes for that as well. Take up a new sport, and better yet, get a friend to go with you. The added social benefits you’ll get from hanging out with a friend will make the activity even more uplifting. 3. Create a goal and make plans for completing it. Want to get into running? Sign up for a 5K for the spring and use the coming months to train for it. Fancy yourself a writer? Make a pact with yourself to carve out 10 minutes each day to write. Whatever your craft, make a goal, and more importantly, a plan to complete it. Sticking to a plan will add interest to your days and come spring, you’ll feel a great sense of accomplishment for all your efforts. Studies have shown that the mere act of planning, and then looking forward to a vacation is sometimes more or as rewarding as the vacation itself. Plan a trip that you can look forward to for a few weeks to ease the winter slump. How do you stay motivated through the winter months? We’d love to hear your tips! Share with us in the comments below.